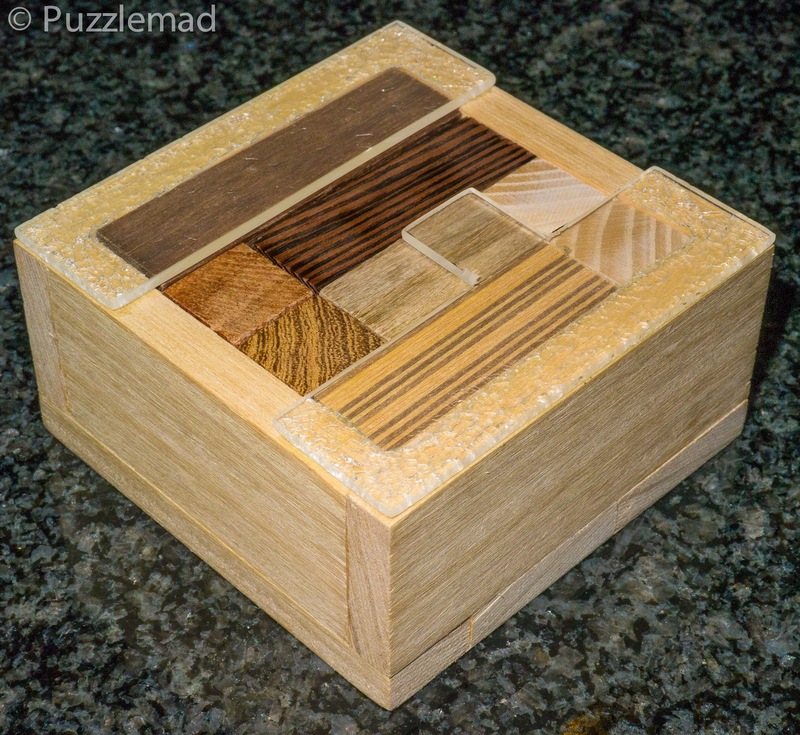 PuzzleMad: Packing puzzles I can do....Almost! 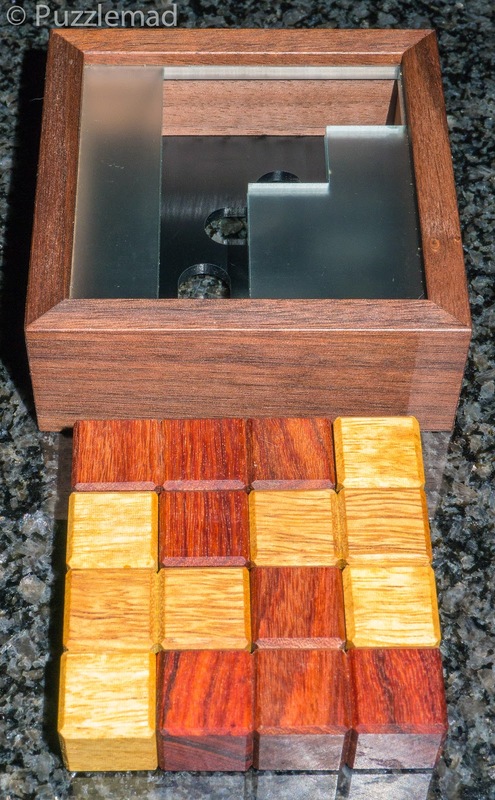 "Packing" or "Sequential movement" puzzles? I have said many times before that I just cannot to packing puzzles! In fact I have actually stopped buying them.... well almost! I do still buy the occasional one if has a particular quirk to it or is made by a good friend or is particularly beautiful! 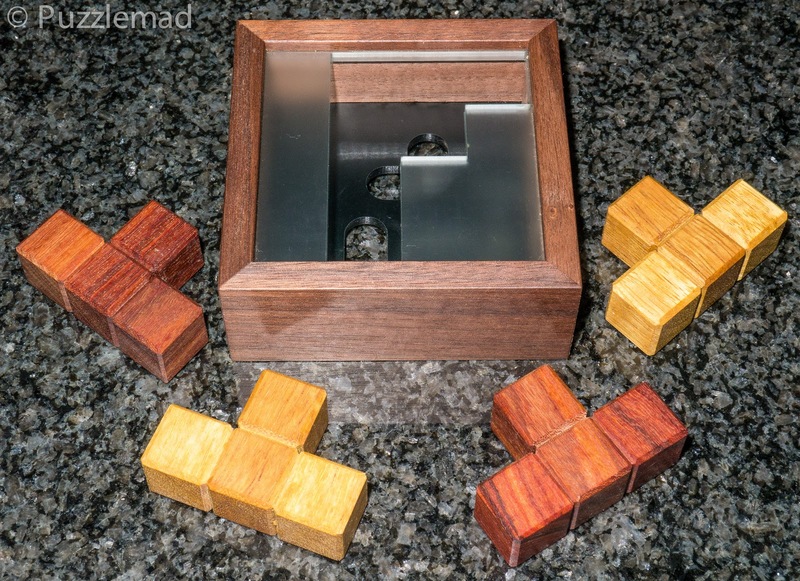 So recently Satomi (who runs the Cu-Japan eBay store) informed us that she was going to get these particularly interesting puzzles from Japan. 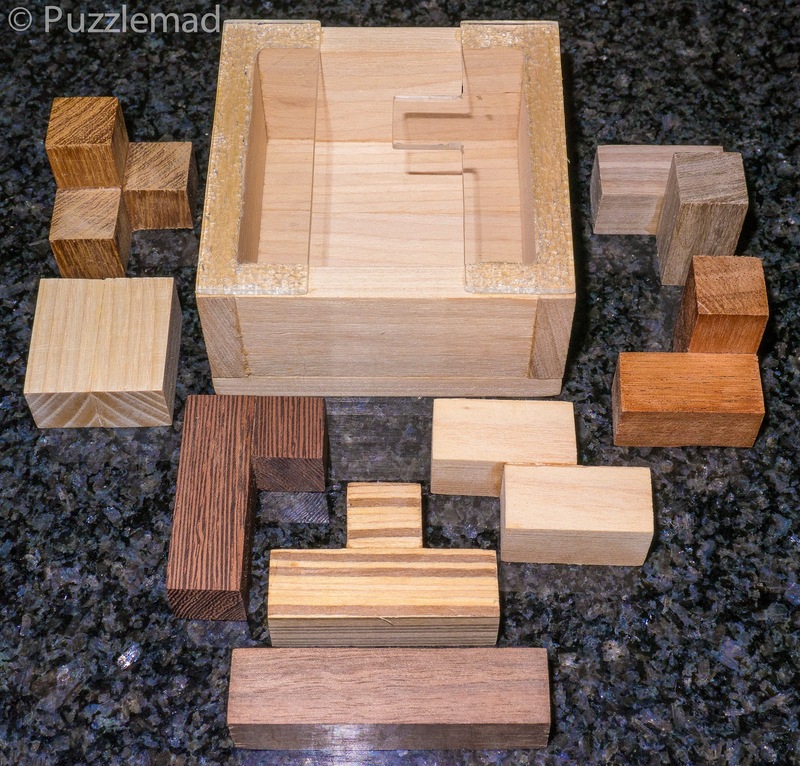 I haven't done many puzzles designed by Mineyuki Uyematsu but those that I have tried have all had something special about them that meant that I couldn't resist! For example the Lock-y-cube and Lock-n-cube that had kept me busy for so long were designed by him. Satomi does not have these packing puzzles in stock at present but she does have a whole lot of interesting stuff and they may come back. I picked these up at the last Midlands puzzle party and barely held back from buying a whole lot more stuff which she had in stock and managed to keep them in their packaging until the following Monday when I was anaesthetising for a Vascular surgery list which consisted of several VERY long boring operations. I reached into my trusty bag and brought them out to a few oohs and ahs and pronounced that: They would be perfect to torture my anaesthetic assistant, any interested nurses and medical students who happen to be nearby. Once the patient was set with his iPod on and safely stable the puzzling began! Starting with Tea for Two, It consists of a Walnut box with a frosted Perspex top and black perspex bottom (both of which have odd shaped holes in them) and 4 tetrominoes - T-shapes made of Mobingi and Pao Rosa wood. Encouraged by a certain nurse who shall remain nameless I experimented with the possible arrangements of the pieces outside the box - I'm not giving much away when I show this. Initial thoughts were to find an arrangement that would leave a piece arranged over a whole and that would be the last piece to go in. We fiddled for 15 minutes and couldn't seem to get the other 3 in the box in a suitable configuration - the required twisting/sliding movements were blocked! There was more to it that I thought - was my packing puzzle jinx going to hit me in public? I tried a couple of other ideas when I was prompted to have an idea. This was a very very good idea because it allowed a whole new range of things to be tried and suddenly I was left with them all inside. The solved puzzle is hidden but you can see it if you click the button. In reality the solution doesn't really explain how I got to that point. Easy peasy? Ahem! Maybe for someone else! Feeling really quite chuffed at my prowess in front of my colleagues, it was then time to try the next one that I had bought: The Tea for Three. This is the same overall size but the T pieces are heptominoes. 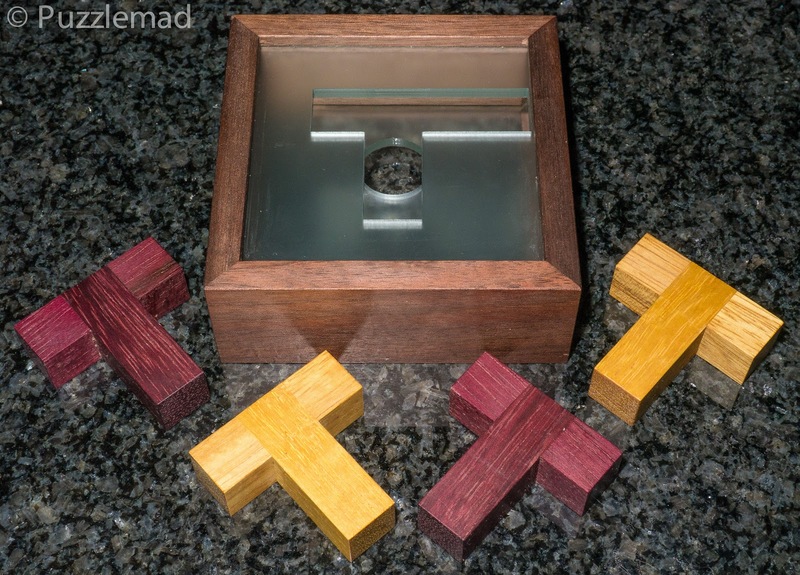 The box is made of Walnut and acrylic again but the T-pieces are made of Mobingi and Purpleheart this time. 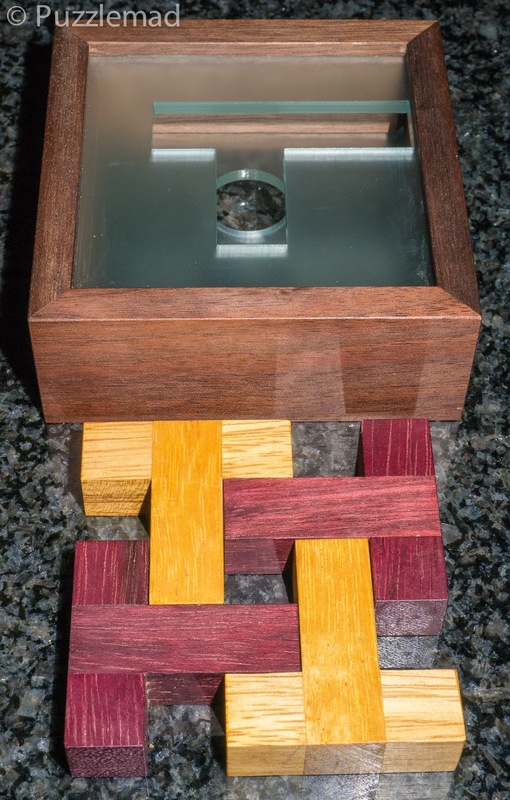 The shape cut out of the acrylic is different on both top and bottom (although this did not help me solve the puzzle). Of course, my initial task was to work out the possible organisation of the pieces and just as before, there was only the one (or it's mirror image) - shown to the left. So if you do get a chance to try some packing puzzles that also require sequential movement then I can heartily recommend these! If you have access to a 3D printer and a laser cutter then they can be made to order too but I can heartily recommend the wonderful puzzles from Satomi at Cu-Japan. That's only true of packing puzzles George! As you saw, as soon as a 3rd dimension was added, I really struggled. 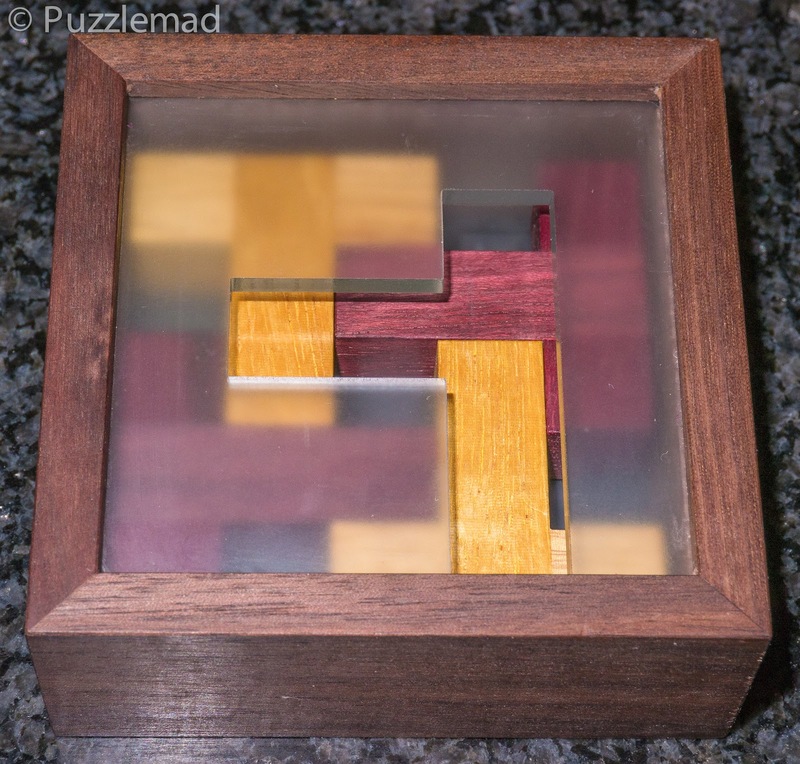 But I do love my twisty puzzles which are very 3 dimensional! That's true about twisties being 3d. One could argue that wire puzzles are one dimensional, so they should be easy, right? Easy? I'm obviously not doing the wire puzzles right because I find them really quite difficult! Well, a string is a 1D object, but to tie it in a knot you need 3D. So I think wire puzzles are 3D. Some of mine have proved so tough that they make extend into higher dimensions still! Amazing! You have 4th dimensional scissors? Mine only cut the 3D parts which is a bummer! Yes, very expensive. But worth every penny! And I am always losing them in the space-time continuum! You should make a leash out of the snippets of 4th dimensional string you have lying around! That way you can tie the scissors to you in an unobtrusive yet perfect way! Hi Kevin, nice aren't they? 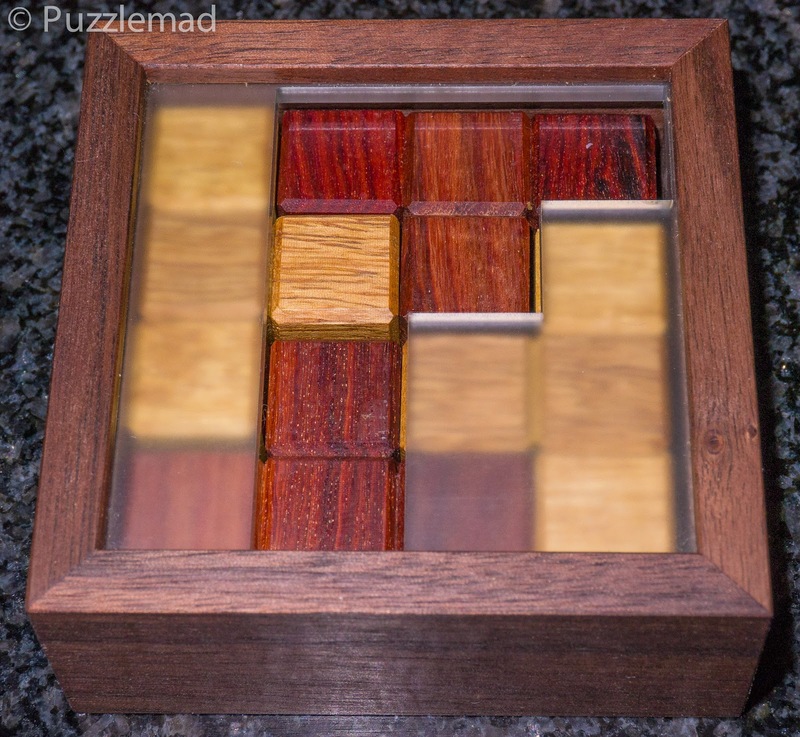 I really like MINE's packing puzzles, just the right amount of difficulty! This looks very nicely implemented! Well done!